Here I am in Pendlebury, Salford visiting the crash site of a Lancaster PB304 bomber. On Sunday 30th July 1944 all seven crew members of 106 Squadron died along with two people on the ground when the bomber spectacularly exploded. The bomber was brand new and had been bombing German positions at Cahagnes in Normandy, France. It had joined a sortie of 462 Lancasters, 200 Halifax bombers and 30 Mosquitos but the low clouds were so thick and many pilots were ordered not to bomb. The Lancaster PB304 was laden with bombs but returning crews could not ditch their bombs in the English Channel due to ships supplying good to the invading forces. 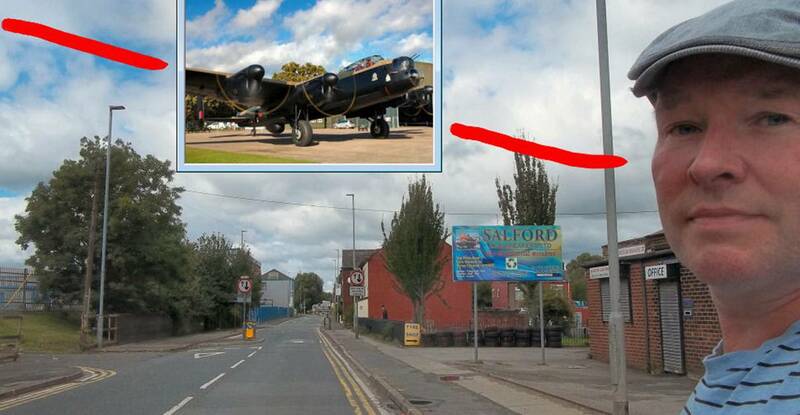 Nobody really knows what happened to the bomber (it was possibly struck as it circled over Normandy) but it was in trouble as it flew over Salford on the way back to RAF Metheringham, Lincolnshire. The pilot tried to land at Littleton Road playing fields. Witnesses said they noticed port engine trouble but it remains a mystery. For some reason the landing was abort and the bomber circled to return and try again. The landing was going well until a wing clipped the top of houses in Regatta Street. The bomber crashed about two hundred metres away on the far bank of the River Irwell. If any of the crew were alive and in agony it would not be for long. About thirty seconds after the crash the bombs on board exploded. The plane was laden with so many bombs they had nil chance of survival. I drove up Langley Road over which the bomber had flown and turned left into Regatta Street (the Sat-Nav said it wasn’t reachable by car.) I parked up and looked at the rear of the houses and matched them with a photograph I had. I wondered exactly which chimney had been clipped by the plane. I walk passed scrap land and down a steep bank to the River Irwell. Across the way there was no sign the bomber had crashed there. The residents in these houses must have wondered what had punctuated their quiet Sunday in July 1944. There was no plaque, no crater grass would not grow on, nothing however just up the road is Agecroft Cemetery and there’s a memorial stone dedicated to the bomber crew. Are these the same houses?